Hey folks, sorry for the total and complete lag on my monthly income reports, lot’s of things been happening. 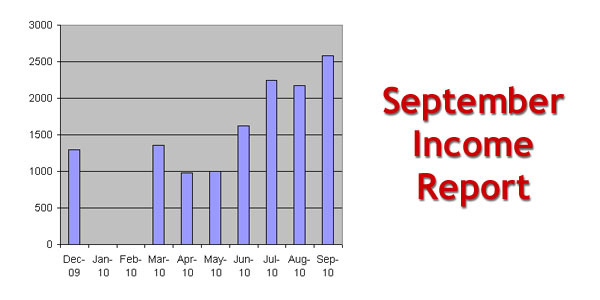 So this is September 2010’s income report, 5 months late, but I guess better late then never. So the past few months I’ve been perfecting a system of how I build niche sites, how I place content on them, and how I get them ranking with back linking strategies and such. I’ve been working hard at this as I am putting together a membership course for niche site’s and niche marketing. I’ve been using ReviewAzon for getting some content up really quickly and highly suggest it. See my review HERE. I’m sure there’s a few people out there who have a little extra time and would like to know how to do these little niche sites that build recurring monthly passive income. How’s about an extra $1000-$2000 a month sound to you? I’m sure for some of you it might make all the difference in the world to have a little more income than you have now. Especially in this economy, right? I know every cent counts for me, seeing as how this economy had tore my day time business apart. Which is why I turned to the internet to supplant that income. This months(September) Amazon was way down, and in my August report it had come up from the previous month, but then went down again. This is all catch up from the past months of figuring out how I was going to make the Amazon Associates thing work for me, as it had started to actually make some income, and got me thinking. You’ll see from this month out, the Amazon income will be going up, and way up in December, but that’s another report. So even though my Amazon was down many other things were up and going up steadily as I somewhat predicted a few income reports ago.You’ll see somethings fluctuating from this report forward but you should also see things going up. Way up. So enough of my yakking, I’m getting ready to do a podcast with a special guest which will be released next week, so stay tuned. I’ll be catching up over the next two weeks on my income reports so stay tuned for those as well.